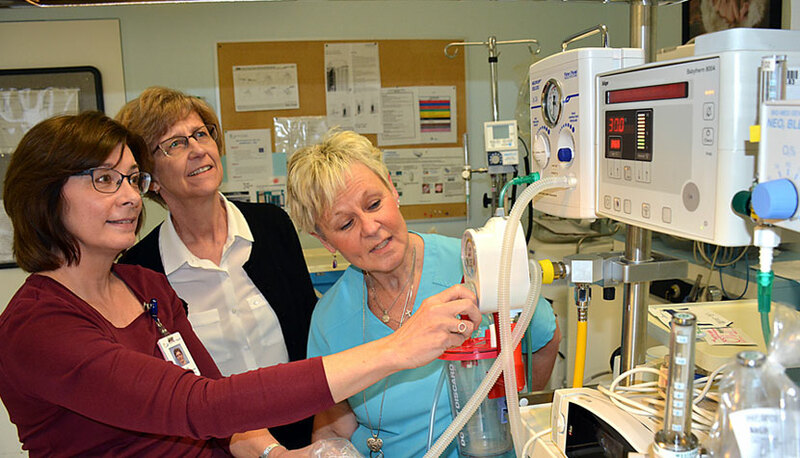 Maureen Spinks, (centre) obstetrics nurse manager at Penticton Regional Hospital, and RNs Sylvie Tanguay (left) and Wendy Imhoff check the nursery’s existing neonatal infant resuscitation warmer. The Sandra Schmirler Foundation has donated $35,000 for a new infant warmer at PRH. While Canada’s top women’s curlers sought a national title in Penticton, the Sandra Schmirler Foundation arrived in the city with a $35,000 gift for the nursery at Penticton Regional Hospital. The donation, presented during the 2018 Scotties Tournament of Hearts, will fund a new neonatal infant resuscitation warmer for PRH. Each year, the national foundation supports neonatal programs across Canada in honour of Sandra Schmirler, the late Olympic and world curling champion who died of cancer at age 36 in March 2000. Since its inception in 2001, the Schmirler Foundation has donated millions of dollars to 48 different hospital newborn intensive care units – including more than $500,000 to six hospitals in BC. The money stems from their national telethon on TSN, this year held on January 28th. “These funds helped purchase equipment that is saving the lives of babies born premature and critically ill right across Canada,” said Brad Sylvester, Chair of the Sandra Schmirler Foundation Board. An average of 550 babies a year are born at PRH – some of them prematurely. Maureen Spinks, the hospital’s nurse manager of obstetrics, said the infant resuscitation warmer supports the needs of premature and sick newborns by providing controlled heating to maintain a baby’s body temperature, while supporting breathing and oxygen delivery, and monitoring the infant’s heart rate. Spinks said the PRH nursery’s current infant resuscitation unit is now more than 15 years old and definitely needs to be updated. “It’s been on our capital equipment acquisition list for a period of time now. The timing of the Schmirler Foundation gift is fantastic,” she said. Carey Bornn, Executive Director of the South Okanagan Similkameen Medical Foundation, noted the Sandra Schmirler Foundation funding comes while PRH is undergoing a major expansion. Penticton Mayor Andrew Jakubeit also praised the Schmirler Foundation gift. The 2018 Scotties Tournament of Hearts was held from Jan. 27 to Feb. 4 at the South Okanagan Events Centre. Jennifer Jones and her Manitoba team won the national championship.